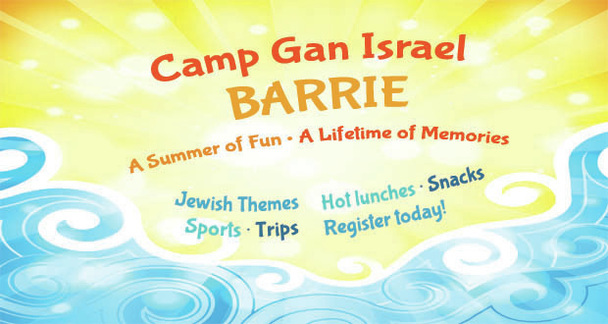 Camp Gan Israel in Barrie is dedicated to enriching the lives of children 18 months to 12 years old from diverse Jewish backgrounds by giving them a deep sense of pride in their Jewish heritage, through a great camp experience, an array of fun activities, athletics, crafts & field trips. It offers an opportune oasis for children to experience the warmth and beauty of their heritage in a safe, friendly, and warm environment. Camp Gan Israel is about making children feel welcome and at home with Judaism in a completely non-judgemental environment. It strives to give every camper the opportunity to take part in traditions they might not have had the chance to practice outside of camp, and helps them build meaningful and lifelong friendships, enjoy outdoor adventure and deepen their love of Judaism. We take pride in our exceptional staff. All staff members come with prior camp experience and a desire to work with children. We take great care in keeping the highest quality staff in the camping profession. This ensures the best possible care, instruction and supervision for our campers. The camp program and schedule is overseen by Rabbi Mendel Nakkar who has over 10 years of experience in the camping field and is the founder of a Jewish Teen camp in Toronto.